Holocaust is a Champions character. 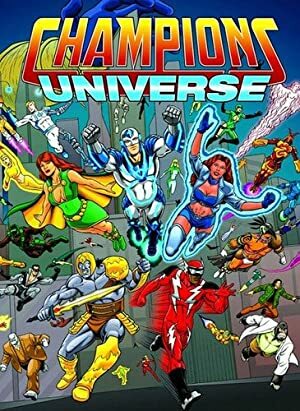 Champions is one of the big classic super-hero tabletop RPGs, with a first edition released in 1981. As of this writing they’re on the sixth edition of the game, system and setting. Holocaust in particular is the cover boy from the 1st/2nd edition rulebook and the very first Champions’ Enemies book, seemingly big, bad, and in all his glory. Known Relatives: Albert Haganstone (PA. Senator and Father), Clarice (Mother). Base Of Operations: Pennsylvania, though mobile. Absorb any type of force. Diminish the energy of attacks against him, and convert it to enhance his abilities. In combat, he relies greatly upon his various eyebeams. His homing blast is capable of arcing around and attacking from behind, taking advantage of his detect power in order to turn corners or hit someone behind cover, etc. He will use his multiple actions in order to get the upper hand if necessary, going on about how superior he is. He’ll commonly save any hand to hand strikes for after he’s already “beaten” his opponent, simply as a means to further demoralize those who would stand against him. Geoffrey Haganstone was born to power- in more ways than one. The son of Senator Albert Haganstone of Pennsylvania and his socialite wife Clarice, Geoffrey was a precocious child. He was far more intelligent and active than his years would indicate. Born into a family of wealth and privilege, he lacked for nothing, and many people predicted he would succeed to his father’s Senate seat one day. When he was a teenager, Geoffrey manifested mutant powers- the ability to control and project energy. Concerned about “scandal”, the Haganstone family kept his superpowers secret, thus allowing him to develop his abilities without hindrance. By the time he finished college, Geoffrey’s combination of power, privilege, and wealth had combined to make him haughty and condescending. He realized he, and he alone, was fit to lead the peoples of the world, and with his abilities, could conquer them. The thought of ruling Earth soon became to obsess him. But he knew even he, by himself, would find it hard to conquer humanity if people did not fear him. Only through fear could his lesser learn the obedience and discipline they so badly needed. 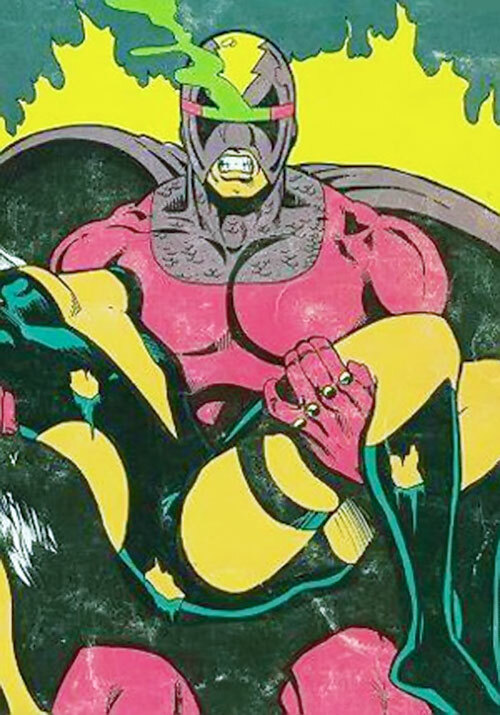 Fashioning a costume and choosing a name designed to inspire fear, Holocaust started his supervillain career by attacking the Empire State Building. A team of superheroes defeated him, but only barely, and he escaped at the last minute. He has tried to destroy major landmarks and institutions, or conquer the world, many times. He never succeeded, but never was captured either. He’s convinced it’s only a matter of time before he finds a way to triumph. Geoffrey Haganstone is a handsome, athletic man in his 30’s. He sports a winning smile and somewhat arrogant demeanor. He’s well known on the American social circuit. Holocaust’s costume is a red bodysuit, with purple boots, trunks, gloves, and gorget that also have a scale motif to them. His belt and the inner wrists of his gloves are gold. He wears spikes on the knuckles of his gloves for even deadlier effect and intimidation. 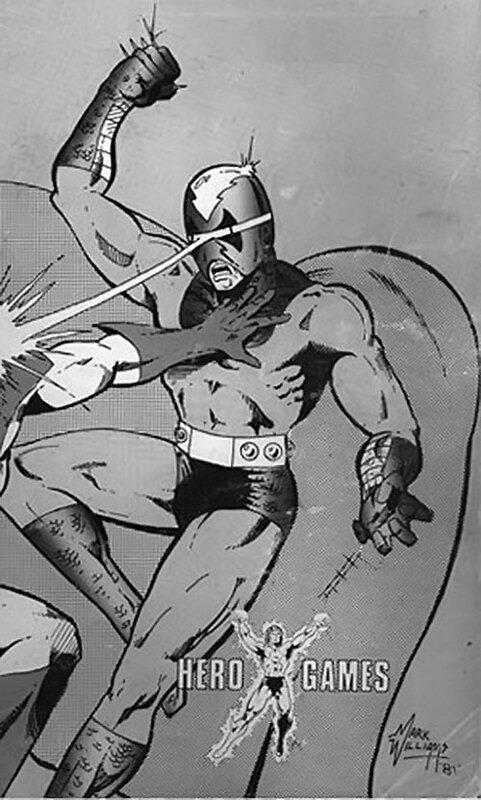 He covers his head with a purple helmet (which leaves his mouth exposed) that has a yellow lightning bolt-like design on top, and a green eyebar from which he projects his eyebeams. He also wears a purple cape. 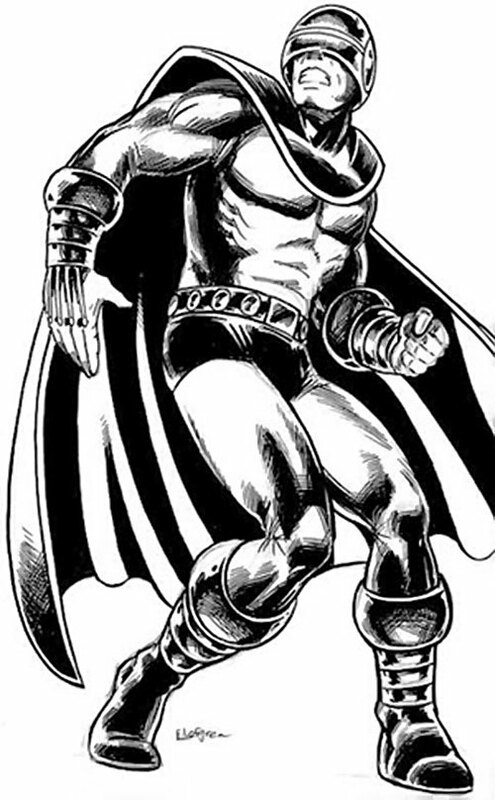 To be honest, the whole ensemble resembles a cross between Marvel’s Cyclops and Magneto. Holocaust is a presumptuously arrogant megalomaniac. He’s certain that he’s superior to everyone else on the Earth, and destined to rule the entire planet. He has so little regard for his “future subjects” that he is known to kill them for the slightest reason. Such as defying him, not obeying fast enough, or even spilling his coffee. This lack of restraint has caused him problems in the past (you can’t ask much from a formerly human pile of ash after all), and undoubtedly will again in the future. Despite his general attitude, Holocaust does feel some stirrings of noblesse oblige. One of the easiest ways to manipulate him is to appeal to his “honor” or his “concern for your people.” It might not always work, but he sometimes falls for it. For all his power, Holocaust is a master villain wannabe. He often hires other villains to help him carry out his plans and provide combat support (likely promising them a place in his new world order, which he will surely renege on when the time comes). He lacks the skills and true ability to conquer the world on his own, though he’s determined to keep trying. What’s one more would-be-world conqueror in the DC Universe? Odds are, he would have fought and been defeated by the Justice League on more than one occasion. EB: 20 is Non-Variable, Lethal, with No AV, and Lack of Control -1CS. EB: 13 has no AV. EB (Cone) is a straight-line Area Effect, max range 4AP’s, area increases 1 AP width each AP of distance- up to 5 AP wide (4 AP from either side of center line). Energy and Kinetic Absorption add to Power Reserve. 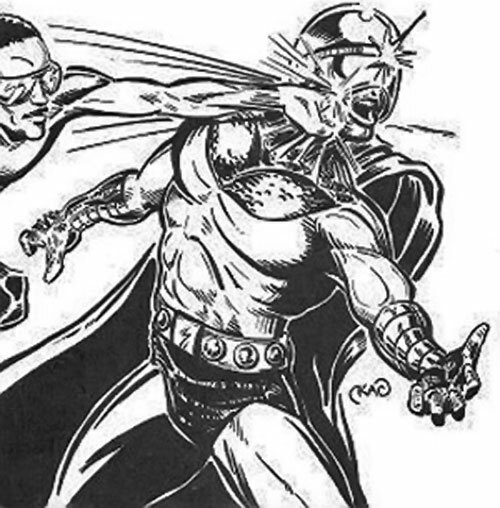 Power Reserve(Str, Bod, all Powers but Superspeed) must be fueled by Absorption powers. Superspeed is used for initiative and multiple actions only. Area Knowledge (Washington DC, New York City), Attractive, Connoisseur, Scholars (Computer Programming, American Politics). American Gov’t (High), High Society (High). Secret ID, SIA (Megalomania), SIH (Being Insulted, Sarcasm, or Not Being Taken Seriously), Unluck. COSTUME [BODY 07, Skin Armor: 01, Hardened Defenses]. SPIKED GAUNTLETS [BODY 09, EV 03(9 w/Str), Hardened Defenses]. AP levels are modeled more after what I feel is the spirit of the character than being based upon any necessarily specific numerical conversion. Yes, the costume armor and superspeed actions are unnecessary, not typical of usual MEGS design, and intentionally twinkish, but that’s him all over. Source of Character: HERO Games’ Champions products, Enemies, and Conquerors, Killers & Crooks specifically. Helper(s): Eric Langendorff, Frank Murdock, KalEl el Vigilante.